No phones, tagging or interruptions. Just play! Register for a free Shot Scope account and download our iOS/Android and desktop apps. Set up your band and simply screw the lightweight tags into your clubs. Play over 40,000 courses worldwide with no interruptions and no subscription. Analyze over 100 statistics on Club Distances, Approaches, Short Game, Tee Shots and Putting. Dynamic yardages give you highly accurate distances to F/M/B of the green and hazards, regardless of your angle of approach. V2 shows both distances to bunkers and water hazards, to further improve on-course performance. To enhance putting statistics, simply press the PinCollect button at the end of each hole. This enables V2 to provide more accurate approach, short game, and putting stats. Dynamic Yardages Provide distances (yards or meters) to the front, middle and back of the green from your exact angle of approach to the green. Distances to Hazards V2 shows both distances to bunkers and water hazards, to help with your course management. Over 100 Tour Level Statistics The online dashboard provides access to over 100 statistics on your game. Analyze and discover where you can improve! PinCollect Records where you putt from to produce highly accurate statistics on your game. Simply press the number of putts you take on the watch, when standing at the hole. PRO – for tournament use when GPS isn’t allowed, only tracks your performance. Automatic Performance Tracking V2 tracks every shot you hit on the course with no user interaction required. Simply wear the watch and play like normal. 16 Club Tags Each Shot Scope V2 comes with 16 Club Tags - enough for each club in your bag plus a few spares if you want to test a new club out. Lightweight and unobtrusive. Club Sense Technology All tags have Club Sense technology to ensure the watch picks up the correct club you have hit. Over 40,000 Courses Shot Scope have a database of over 40,000 courses, all mapped in-house. So we can make any updates to courses quickly and accurately. Premium Support Our internal support team work hard to ensure each user gets the full benefit from their V2. Quick responses and course mapping edits are their specialty. Bluetooth Connectivity No cables required! Simply upload your round via Bluetooth after playing. If you’d prefer to plug in to a computer, you can do that too. iOS and Android Apps Download our Apps and get your statistics on your phone or tablet! The watch can be used with the App alone and/or on the computer. 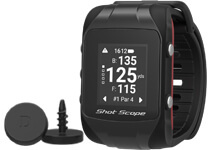 No Tagging Required Unlike other Golf Performance Trackers, Shot Scope V2 does not require the user to tag each shot prior to hitting the ball. Water Resistant Play golf in even the toughest of weather conditions – heavy rain! V2 was designed and tested in Scotland, where it rains non-stop! Easy to Use Shot Scope V2 is easy to navigate with a large clear display screen and easy to press buttons. The distances shown are in large font. Medals Earn Medals for on-course achievements such as hitting a drive 200 yards, or holing a 10ft putt. Leaderboards Climb up Global or Private Leaderboards with other Shot Scope users and friends, as you have a low round, hit a long drive, hole a long putt and many more.